Superb review Jacqui. I love the quality of Cather’s writing and her sense of place. You’re right about Antonia’s presence in the novel making the narrative shine more than when she is more in the background. Glad you enjoyed it. Of Pioneers would be perfect to move on to. Many thanks, Ali. Yes, I loved the way Cather captured the landscape and the sense of place of this novel – her descriptions of life on the prairies are so striking. I’ll be heading over to yours later this morning to have a proper read of your review as I’d been holding off until this post went up. That’s excellent news about ‘O Pioneers!’ – it’s definitely on the list as a follow-on read. Hi Ali, Poppy’s just asked a question about the best place to start with Cather’s novels (see her comment below). If you get a chance, would you be able to give a view on this? My Ántonia was my first, so I’m in no position no advise. Many thanks! Nice review Jacqui. I love how you picked up on the industrious immigrant girls (hmm, things don’t change much). I found the observations striking. The tremendous spirit Antonia embodies and the harsh and exacting descriptions of prairie life make this one of my favourite books ever. Western Canada where I live had similar central and Eastern European immigrants who arrived to unbearably harsh conditions and from sod homes they eventually built homesteads and full lives. But it could not have been easy. Antonia’s father’s despair and fate breaks my heart, but her fortitude and survival is not only inspiring but not over romanticized as it might have been in another author’s hands. Thanks, Joe. Yes, the contrast between the immigrant girls and their native-born counterparts turned out to be one of the most interesting aspects of the novel (well, for me anyway!). She’s very good on these differences, Cather – I noticed several in the novel. I guess it’s still a very relevant story in many ways. I agree with everything you say about Ántonia (and her father for that matter, so heartbreaking) – her inspirational spirit just shines through. I know how much you love this novel, and I really wanted to feel the same way about it too. It turned out to be a book of various parts for me…possibly too many. I loved the first section on the Shimerdas early years on the prairie (which to be fair is the longest of the five), and I really liked the second on Ántonia and the other hired girls in the town. But the momentum just fell away somewhat when the focus shifted to Jim and Lena in part three. I wanted more Ántonia, more of her determination, more of her struggles in life (however hard they turned out to be) – I appreciate we’re seeing everything through Jim’s perspective, but even so, I wanted to to hear more about those intervening years. The final section pulled it back though, and I’m so glad Cather returned to Ántonia in the end. I loved that section too. I read this prior to blogging and I do seem to remember a lull in the narrative but it does not impact my long term memory and affection for this book. I wonder how the story will weigh out with you over time. That’s really interesting, Joe. Yes, I wonder how this novel will settle in my memory in say 6-12 months time. I loved the early sections of the book (and the final chapter), so maybe I should have stated that more clearly in my review – bearing in mind their length relative to the middle sections, they probably represent a good two-thirds of the novel. That’s a great point about the middle sections and the way that distancing effect only heightens the emotional weight of the ending. It simply hadn’t occurred to me before, but now you’ve mentioned it, that makes a lot of sense. I really must read more of her work. The one I have and am looking forward to is called Death Comes for the Archbishop. Great title. I’ll be interested to hear more about it, Joe. Death Comes for the Archbishop was one of the book recommendation I received when I asked about books set in Santa Fe. Superb review Jacqui… Cather is on my list of authors to explore more having seen/heard trusted recommendations and read some of her short stories. This certainly makes her novels sound a rewarding read too. Is this a good one to start with or would you recommend another first? As for where to start with her novels, I probably not the best person to give a view on that as My Ántonia is the only one I’ve read so far. It’s certainly one of her best known books, but then again I’ve seen quite a few recommendations for O Pioneers! and The Song of the Lark, too. (I think they’re all part of a loosely connected trilogy.) Ali might be able to give you a better view on the best entry point as I think she’s read quite a few of Cather’s novels. Poppy many people seem to start with My Antonia or O Pioneers which I think are a pretty good place to start. A Lost Lady would also be good, many people consider it her best novel. Thanks, Jacqui. A great review. I love Cather’s writing and would certainly recommend O Pioneers. I read it least year and am determined to read the rest of her novels. You’re welcome, Julie. Oh, that’s good to know. Pioneers next, I think. Yes, Cather’s writing is beautiful – I definitely want to read more of her. What a lovely, thoughtful review. I discovered Cather when I’d read very little American literature – just a few childhood classics – and I was swept away by her evocation of a world quite unlike anything else I knew. I’m so pleased to know that you appreciate her work too. Thanks, Jane. It was your recent review of O Pioneers! that encouraged me to pull this one off the shelf last month. I loved Cather’s evocation of the landscape and life on the prairies. She writes so beautifully about the challenges and hardships of this world – and then there’s Ántonia’s character of course, her vitality and determination to win through. I definitely want to read another of Cather’s early novels in the not too distant future, maybe early next year. O Pioneers! most likely. Thanks, madame bibi. It’s absolutely worth reading, and I’ll be interested to see your take on it. With a somewhat episodic novel such as this, I guess it’s inevitable that certain sections are going to resonate more than others. The writing, however, is wonderful throughout, so I can fully appreciate the appeal of Cather to a multitude of readers! A very evocative account, Jacqui — many thanks. I keep meaning to read me some Willa Cather and not getting round to it. I really must get my act together. Great review as always, Jacqui. I have so much Cather on my shelves (including this one) but I’ve yet to read anything more than short stories. But this sounds very compelling and know her novels are very highly thought of – I will pick them up eventually! Thanks, Karen. One of the tweeters over at the @Read_Women account replied to say she’d enjoyed Cather’s stories too. I wasn’t aware that she’d written shorts as well as the novels, although it doesn’t surprise me especially given the somewhat episodic nature of My Ántonia – in some ways, it almost reads like a series of interconnected stories. I definitely liked this one enough to try one or two of her other books in the future. Good to hear that you have a stack of them in store. I love pioneering stories, so this is one on my list that I haven’t read yet. The whole immigrant versus American-born theme also sounds interesting! I’m curious, though – I wonder why her narrator is a man and not a woman? (not that I expect you to have an answer to this!). Oh, I think you would really enjoy this one, Naomi. The combination of the landscape and the Shimerdas’ struggle to survive all makes for a very compelling story, particularly when Ántonia is firmly in the frame. I’m not sure why Cather decided to go for a male narrator in Jim, but a couple of things strike me as being relevant. (I’m just speculating here, so these are just my own impressions.) Firstly, I think Jim’s relationship with Antonia is absolutely central to the narrative. We have a boy and a girl growing up together side by side, and the gender dynamic is an important aspect of their shared bond. So, even though they aren’t girlfriend and boyfriend, the possibility of a romantic attachment of some sort almost hovers in the air, albeit in the background. Secondly, the fact that Jim is male puts him in better (or more objective) position to be able to observe the distinctions between the hired girls (those from the immigrant families) and the country girls (their native-born counterparts) which form such a key aspect of the second section of the novel. I’m not sure this would have worked quite as effectively had Cather gone with a female narrator. I guess she could have chosen to narrate the whole story from Ántonia’s perspective, but that would have made it a different book. As I say these are just my thoughts, so if anyone else has a view on this, please feel free to pitch in! Thanks for your thoughtful answer, Jacqui! You’re very welcome, Naomi. I hope you get a chance to read My Ántonia at some point, would love to hear what you think of it. Great review – and I particularly appreciate, in these awful times, your last quote. I feel as if I need to hold on, tightly, to any reminders of the generosity and creativity and betterment of the human spirit, human kind and what human endeavour can do. I feel as if I am slumping into a sense of shame about my country, its people and my species as a whole. We all need role models and ideals to aspire to – and, of course, some of them may be creations from fiction – which are creations of human aspiration and visions too. Many thanks, Lady F. I’m glad you liked that final quote. It was quite hard to find a short passage which captures Antonia’s humanity, her sheer grit and determination, her strength and optimism, but that’s probably the one that comes closest. I’m completely with you when it comes to both the need for role models and the view that some of them can be found in the best fiction. It reminds me of how I felt when I read Little Women all those years ago when I was very young and impressionable and in search of some inspiration from books. Given your tastes in literature, I’m fairly sure you would enjoy Cather. I’m very glad to have discovered her at long last. As is the case with so many of these authors, I only wish I had found her a little sooner. Yes, I’ve started to keep a rough list of them. It’s divided into a couple of groups: ‘breadth’ – new-to-me writers to try for the first time; and ‘depth’ – favourite writers to read in more detail. I almost bought O Pioneers recently when it appeared as a Pocket penguin – there were quite a few positive tweets about it. Now with your wonderful review, and the discussion above, I think I will have to try her! Ah, yes. I’d forgotten about the inclusion of O Pioneers! in the recent wave of Pocket Penguins. Well, that’s another good reason to pick it up in the future. I would definitely recommend you give Cather a try, Grant. Her themes are very interesting, and she can combine the sweep of the Midwestern landscape with a focus on the lives of its inhabitants. This is a favourite of mine and as such I’ve read it twice now, and would consider reading it again. I tried reading Death Comes for the Archbishop years ago but gave up on it—I can’t remember why. I’ve seen recent blogs on The Professor’s House which have made me want to read more by Cather. I could imagine re-reading this one day, especially the early sections which I loved. It’s quite a rich book in some ways, especially in terms of its insights into the human condition. Funnily enough, I actually have a copy of The Professor’s House, an old Virago edition in the trademark green livery – a lucky find in a secondhand bookshop. I’ll probably try to keep it for a while until I’ve read O Pioneers! (and maybe one or two of her other early ones), but I’d love to hear more about it. I hope you’ll review it, Jonathan. I’m really glad I picked it up. It was a late addition to my list of books for the Classics Club as I’d seen one or two lukewarm comments about it alongside the more positive ones. Nevertheless, I decide to go for it in the end as Cather has such a wealth of fans, and I wanted to her experience her work for myself. Even though I found the midsection a little less engaging than the rest of the novel, it’s absolutely worth reading. Cather’s descriptions of the land are simply wonderful. 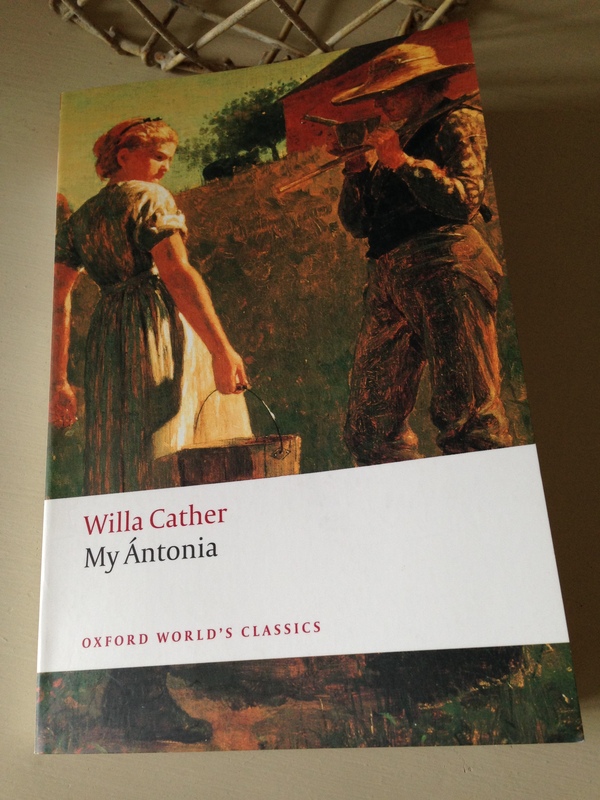 I have not read Willa Cather but I would like to. Your commentary here makes me want to read her more. I like that 1st quote that you posted, Books that cover a big swath of a protagonists’ life, and that show change in the protagonists, often appeal to me. I was wondering if you might have read Cather in school as she strikes me as being the type of writer who would have been included in the curriculum when you were growing up. (Maybe she still features in schools and college courses, I don’t know?) My Antonia feels like that type of book, especially given the social and historical context. Glad you like the sound of the quote – I really think you’d get a lot out of this novel. I think I have three of her books but haven’t read any of them yet. The Professor’s House is the one that tempts me the most but your lovely review of this one tells me I’ll like it. It’s good to be “warned” about the episodic structure of the book. Oddly enough, I have a copy of The Professor’s House too as I couldn’t resist buying a lovely old green Virago edition when I spotted it in a secondhand bookshop earlier this year. Plus it sounded like a good one to have on the shelf for later. Now I’m curious to discover what you’ll make of Cather whenever you get a chance to try her. It sounds nice, but not essential. I note that Emma described it potentially as a good YA read which is terribly offputting. What prompted you to read this one? Cather’s been on my radar for a while, and I’d been toying with the idea of reading her before I put together that list of classics back in December – she seemed a natural choice, albeit a fairly late addition to my final selection. It was between this one and O Pioneers! (another of Cather’s early ‘Great Plains’ novels) as they seemed to be her two big-hitters. In the end, I plumped for this one as I’d seen quite a few positive reports about it (mainly via tweets and a few other comments here and there). Plus it’s one of roughghosts’ favourite books – I think he’d recommend it a while back, and another bookish person had been championing it too although I can’t remember who right now! Emma’s review made me think twice about it, I must admit…but I guess I wanted to try it for myself. Emma’s right to say it would be suitable for teenagers. In some ways, the style is very traditional, and I could see it being taught in schools especially given the historical and social context of the book. That said, there’s much for adults to enjoy here too. Cather’s themes are interesting, and it has that combination of sweeping landscapes and characters the reader can invest in. Plus it’s beautifully written. I loved the opening sections and the ending (if anything, I wanted more Antonia in the story, more of her challenges and spirit). That said, I can completely understand why it doesn’t grab you! In any case, the last thing you need from me right now is another must-read book – you’ve got more than enough of those already! I agree with Jacqui’s answer. It is suitable for teenagers because it’s an easy but interesting read. Like The Red Pony by Steinbeck. It wasn’t meant to be read by younger readers but it’s a readable book for less experienced readers. Great review. I could hop on to the blog only today though I said I will visit it yest or so on Twitter. Thanks. I would definitely recommend it, especially as you’ve already had the lowdown from your friend. Antonia is the star here (well, she shares that billing the landscape) and it’s interesting to see how her character changes over time. The focus is on her childhood and adolescence as opposed to her adult life, but I’m glad Cather returns to her in the end. It makes for a fitting close to the story. It’s a long time since I read My Antonia and I remember being slightly underwhelmed and yet it also got under my skin. Perhaps the beautiful descriptions and the slightly barren landscape left me feeling strangely unconnected. I don’t know. It is a good book, but one to read more than once I think. Excellent review as always Jacqui. Thanks, Belinda. This novel got under my skin too (that’s the prefect description). I’m pretty sure Ántonia and her story will stay with me for a long time – in fact it’ll be interesting to see how it settles in my memory over the next year or two. Even though I didn’t love the midsection as much as the other bits, it’s a novel I would consider reading again at some point. Have you read any of Cather’s other novels besides this one? I would consider reading it again too, it felt like one of those books that enriches on each read. It’s the only book I’ve read by Cather. Yes, the sense of humanity would draw me back to it. I’d like to read another of her Great Plains novels next – O Pioneers, I think. I’ve read just about everything Willa Cather ever wrote and consider her one of the greats. Thanks for the review. I definitely want to read more of her. She strikes me as being an important novelist, someone to explore further in the future. It’s good to know you rate her so highly. Great review, Jacqui. It gives a good impression of the book. It covers a lot of ground on the settlers’ life. It was an interesting read but I wasn’t as fond of Jim as I was of Antonia. Like you, I think the sections where she’s present are better. It doesn’t romanticise the life of pioneers but it’s not as realistic or chilling as Annie Proulx. Annie Proulx is a good reference point. I’ve read a few of her Wyoming stories (including Brokeback Mountain) but nowhere near enough. Emma is right – this is a good book for teenagers (for adults too, of course). In fact, I first read it when I was a teenager and still think almost every day about the story of the wolves – which is also a story of how young people get enchanted by stories. I like Cather quite a lot, despite my having read so little of her. I like O Pioneers! perhaps even more than My Antonia. Thanks for reviving my interest; I should try some of her later works. It does feel like a book that would resonate with teenagers. In fact I would love my 15-year-old goddaughter to read it but fear she might consider it a bit too traditional (for that read ‘old-fashioned’). I really want to try O Pioneers! – actually, in some ways I wish I’d started there given that it’s the first book in her Great Plains trilogy while Antonia is the last. Really glad to hear you liked it, and that you rate Cather in general. I don’t think she’s very widely read over here which is a shame. Great. I’ll take a look at your review as I’d like to read more Cather in the future. Thanks for the link.